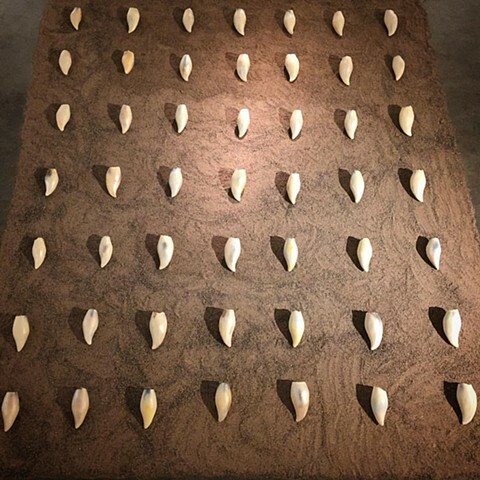 12.5' x 12.5' x 5"
The Sperm Whale Teeth reference the amount of teeth of at least one adult Sperm Whale, conceptually relating to an abundance of material, access, environmental sustainability and cultural viability. This work is a response to the history of the whaling industry, subsistence harvesting rights, living off/on the grid and notions of personal responsibility towards the life and death of a whale as currently over 50% of whale deaths washed ashore are caused by ship strikes. "Account" acts as a record and account of issues of cultural viability as it pertains to our cultural landscape as coastal peoples.